Three-quarters of students entering college lack the writing skills they need for success. A five-week teacher-facilitated resource that guides students through the composition of a research-supported persuasive essay. Designed with the challenges of classroom composition instruction in mind, CRWE provides the kind of writing experience that will best equip students for college success, aligning task and instruction with college-level practices and concepts. We did something that hasn’t been done before: We took the extensive research on college-ready writing—including frameworks for success, best instructional practices, and composition theory—and translated it into a focused, easy-to-implement resource for pre-college and early-college classrooms and programs. We designed CRWE on deeply researched, evidence-centered principles, so that schools and instructors can have confidence that their students are acquiring the competencies most needed for college-level writing success. We set out to understand the college-ready writing gap by analyzing the rich body of scholarship on the differences between pre-college and college-level writing instruction. CRWE reflects the best of what we know about college-ready writing practices, principles, and theory. 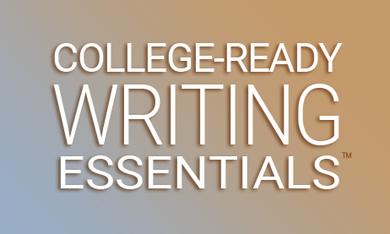 An abundance of research identifies the skills and abilities required for successful college-level writing, and provides guidance on effective approaches to instruction. CRWE is built on these best practices. At the core of CRWE is a detailed framework that precisely articulates the cognitive, noncognitve, and metacognitive competencies the resource teaches to and elicits from students. Our framework is aligned with the Framework for Success in Postsecondary Writing, developed by the Council of Writing Program Administrators, the National Council of Teachers of English, and the National Writing Project. Productive dispositions, behaviors, and habits of mind are essential to academic success. CRWE integrates the learning and practice of self-regulating behaviors and metacognitive awareness into writing instruction and assessment. CRWE introduces pre-college and early-college students to the writing concepts, practices, and performance expectations they will encounter in college settings. CRWE is designed to be easily integrated into existing courses and programs. While instructors can choose to modify, supplement, and adapt the resource as needed, CRWE is complete in itself, including all of the instructional language, exercises, evaluation tools, and other resources needed for a self-contained unit of study. A detailed Instructor’s Guide aids implementation. CRWE is intended for use in pre-college and early-college classrooms and programs. It is suitable for composition, English, or rhetoric courses, but also for history, communications, culture studies, social science, or other contexts—wherever students may be asked to practice disciplined inquiry: to discover a topic that interests them, define an issue, research it, consider multiple perspectives, and produce an extended composition that takes a position and supports it with evidence and argumentation. Since students choose their own topic to research and write about, they may take multiple passes through CRWE, perhaps in different courses or programs, accumulating and improving skills with each iteration. …is to provide more students with effective writing instruction, practice, and assessment, to improve their opportunities for success at college-level academic work. …targets the right skills and concepts and teaches them in a way that mitigates existing instructional challenges. We aim to better prepare more students for college-level writing, reduce the need for remediation, help increase completion rates, and ultimately better equip more people for success in their educational pursuits, in their careers, and in their personal and civic lives. CRWE is an equity-minded resource that reflects BetterRhetor’s commitment to helping all students who want a college education succeed in their efforts, regardless of income or background. CRWE was developed by BetterRhetor Founder and CEO William Bryant, PhD. Dr. Bryant has more than thirty years of experience as a writer, editor, and educator. As Director of Writing Assessments for a major college admissions testing organization, he worked extensively with student writing, gaining a deep understanding of the college-ready writing gap and its causes. CRWE reflects BetterRhetor’s commitment to helping all students who want a college ed-5-5ucation succeed in their efforts, regardless of income or background. CRWE is available via Canvas LMS—using our environment or yours. Visit our demo page for an in-depth look. We can also adapt CRWE to any other LMS, or provide a printable version. To discuss opportunities for your students, please send us a message below. Or email us: hello@better-rhetor.com. YES, I'D LIKE TO DISCUSS! Want to receive FREE college readiness & student success updates? Join BetterRhetor's email list to stay informed—we'll send you the helpful stuff to know! Help your students & friends prepare & succeed!